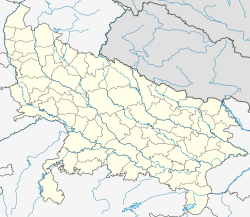 Uttar Pradesh is a state in northern India. For short, people call it UP. Lucknow is the capital city of UP. The population of the state is 166,052,859 (census 2001). It covers an area of 93,933 mi² (243,286 km²). It is bigger than the United Kingdom but smaller than Guinea. In traditional Indian geography it falls under the North Indian zone. The smaller Vindhya Range|Vindhya Hills and plateau region in the south. There are hills, plains, valleys and plateau. It is harder to get water. Rainfall: Rainfall is between 1,000 and 2,000 mm (40–80 inches) in the east and between 600 and 1,000 mm (24–40 inches) in the west. Most of the rain is due to the southwest monsoon. It lasts from June to September. Consequently floods are a problem during those seasons. They badly damage crops and property. This page was last changed on 15 May 2014, at 11:23.